DynoTune Product, 007.1-Round Digital Nitrous Pressure & Wideband PSN-1 - DynoTune, Nitrous systems, Purge kits, Nitrous Bottle heaters and more! >Patented DirectDigital� wideband sensor control, the only 100% digital wideband air/fuel ratio technology! 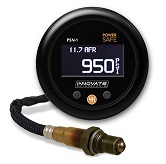 PSN-1: PowerSafe Nitrous Bottle Pressure & Air/Fuel Ratio Gauge Kit - includes the PSN-1 gauge, 1500 PSI (103.42 BAR) pressure sensor, LSU 4.9 wideband oxygen O2 sensor, 8 ft sensor cable, Relay w/harness, O2 sensor weld-on bung, Black/Silver bezel, Black/White faceplate, Serial program cable, & Installation manual.